Personally a few years ago, I felt the alt' scene, particularly the goth scene was in drastic decline and the only way feel a part of it was via the online community. Newcastle was a desperate cultural waste ground offering very little for the alt community. Slowly, but surely, this has changed with more of a vibrant music scene with more rock nights like Grindhouse, Castle Noir and the return of Trillians. Even the local Discovery Musem held exhibitions with gothic undertones through Refashion and The Steam Punk exhibition. I feel the biggest turn was when the British Library and BBC four calibrated t0 celebrate the 250th year of Horace Walpole's Castle of Otranto. There were exhibitions, discussion and various programmes exploring gothic cultural. I'll stop my meanderings. A few weekends ago, I travelled down to Leeds for the Festival of Gothica It was a celebration of Gothic cultural in Leeds through a range of visual media of independent films, discussions, tutorials and readings. 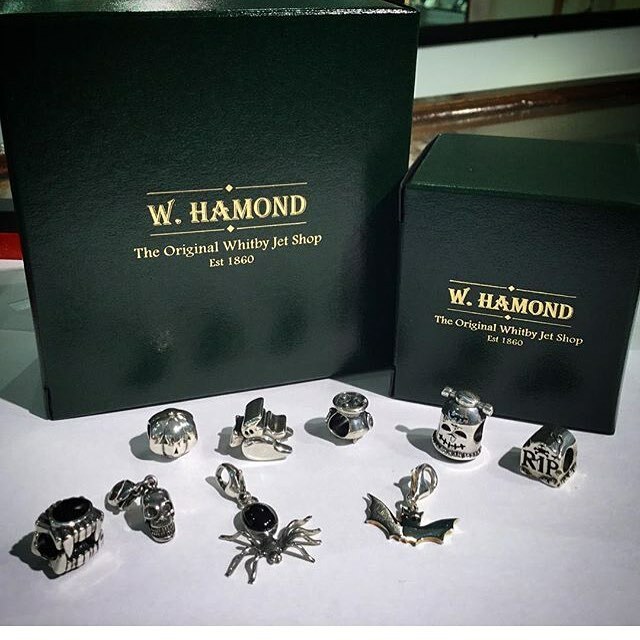 It also featured stalls from independent businesses and charities, including Dead Things by Kate and Soho's Also, the event also featured the W Hammond, The Orginal Whitby Jet Shop; selling from their gothic collection. Sylvia Lancaster from the Sophie Lancaster Foundation there with both a stall and as speaker. I planned to arrive sharply on the for door opening, I spent too time gandering around Leeds Market looking at fabric. Not to mention I had mistaken the museum with Leeds art gallery I found my way by following the black-clad people who were heading to the event. I was greeted by an array of people dressed in a range of historical costume. Outside the museum was a lady clad in wedding resembling Miss Havisham. Another greeter dressed in a beautiful black Tudor brocade dress with a heavy velvet cloak and another was a lady in Victorian mourning garb. I regret not taking photos. They explained the itinerary and orientated me around. The main event was set in the museums the main interior. All the stalls were in a circular formation. As I entered, I heard Spellbound by Siouxsie and the Banshees. Throughout the day there an array other goth music, new romantic, and electronic bands and other 80's music playing. At the centre, was the stage for visitors to take photographs in the thrown or for adventitious Goth wanting the ultimate gothic photo in a coffin. Since I'm afraid of coffins, it freaked me out. The West Yorkshire Playhouse Costume Department kindly loaned the exhibition their collection So anybody could dress up for photographs. I got dressed up in this gorgeous medieval brocade dress I dreamt of owning, when, I was a baby bat. Another person decided it was fun to dress up. The exhibition had a gorgeous selection of Victorian and gothic costumes, which were on display in the centre of the room. I couldn't help, but ogling each one. 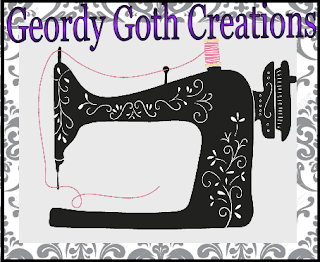 I feel this event was more designed for the goth community or those with a gothic sensibility with the events and stalls on offer. The organisers extended the invitation to anyone from outside the community. 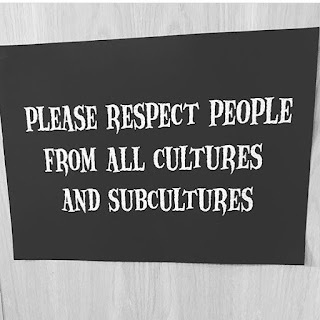 They had a lovely sign asking everyone to respect each other, creating a welcoming environment. 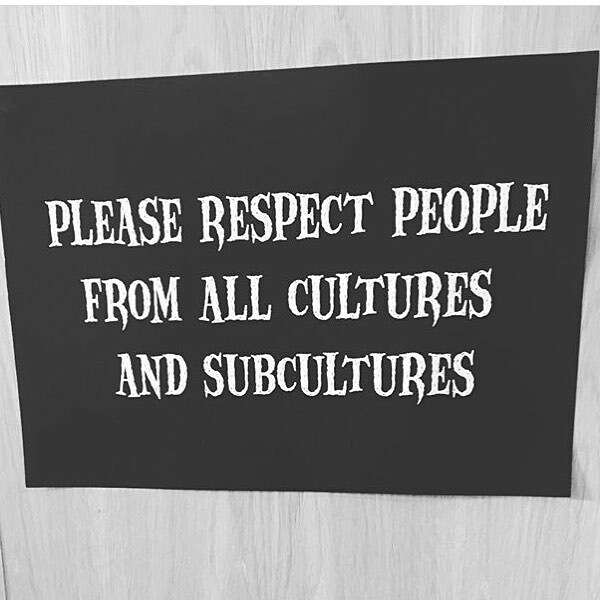 I think sometimes even the goth community can forget this when it comes to internal politics. I also, assumed it was to show we're not all scary we are just like everyone else working and paying taxes; we have a different mindset and aesthetic. Also to share and celebrate Leeds importance of the birth of the early goth movement with its rich history and culture of producing bands. 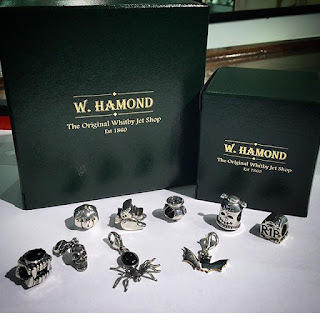 One of the things, I was excited about, was W Hammond, The Original Whitby Jet Shop, who gained fame by supplying jet mourning jewellery to Queen Victoria. It became a must-have for mourners. They still follow this tradition of selling locally sourced Whitby jet. They now, even, produce a gothic inspired range for the darkly inclined, sadly I missed this stall. The nearest stores are in Whitby and York. I do love my Whitby Jet; I own a few pieces and even one a necklace from W Hammonds. Honestly, I mainly hid away with the various discussions, which meant I missed out on some of the other exhibitions. The first discussion, I was mostly excited about Judith's Simpson academic discussion on Victorian Mourning Presently she is researching and producing her dissertation on for her PhD. I have a basic understanding of Victorian Mourning, and I am aware of how prevalent death was particularly infant mortality. After attending the discussion, it gives me a far new understanding on the importance of funeral mourning and how integral these customers were to Victorian society. Judith delivered a fantastic and fascinating presentation which highlighted her flawless knowledge. My favourite part was how she brought the human factor of the subject by looking from the social perspective of exploring the everyday lives of people. So This is what I learnt from Judiths session. With death being, so common in society and Victorians were far more religious in comparison today They believed these rituals prepared a place in heaven for their loved ones and the importance of staying in touch with them. Mourning was such an integral part of society that there were etiquette books written how to correctly carry out the practices, which were very complex and complicated. Some common practices included that all members of the family don mourning garb even babies wore black armbands, there was a separate mourning tea set china produced for the events, often most people would don black clothing and commonly made from crepe. There was such an emphasis on mourning that often families prioritised saving for funerals, rather than spending money on health care. Victorians feared of their bodies would be used for medical dissections, people believed this could impact their fate in the afterlife. Often medical hospitals secured the bodies of both prisoners who had been executed or bodies from people who had been in the workhouses who no way of paying for burial. Mourning was a way of demonstrating compliance with contemporary social norms. It meant that the deceased person wanted to be recognised as a valued citizen with a respectable reputation. Mourning reflected society with families compiling to a strict hierarchy, who was important e.g. husband and parents that reinforced society structures. There were three types of mourning, family mourning, court mourning and complimentary mourning, which was mourning for close friends or their families Families were expected to go through four types of mourning However, the expectation of men and women differed with men expected to mourn for six months where women were far more restrictive there were expected to remain at home and be somber. For the first stage, women were expected to don black within silk crepe for a year and day. Then they would In half mourning allowed to wear sombre of mourning including other colours outside of black eg grey navy blue or lavender. Often, women would wear mourning jewellery which was dull the most popular were the jet and some contained their loved one's hair, that symbolibses immortality and remembrance. Judith explained how in the Victorian period mass production became available and very popular amongst the middle classes which also led to the development of departments stores. Often stores took advantage of the mourning as the whole practice was very expensive particularly with all members of the family expected to don black. Often people could purchase the material at the department store that the could have these made up intern because almost one in five families lost a loved one. The mass production of the clothes meant sometimes the clothes were poorly constructed or finished off. After the mourning period was finished it believed to be bad luck to keep the crepe within the house and had to be rid off, which meant that families might continually be purchasing new mourning clothing. Often this meant shopping was the only respectable ways women able to enjoy themselves as they were expected to stay at home to mourn the passing of husband. Eventually, mourning became less fashionable due to increases in life expectancy, society became less religious and more rational and views on women and expectation were changing Also, more women were entering the workplace, black dies were poisonous and created abhorrent working conditions for workers. During, the First world war there was so much death and the Government and society wanted to maintain people's morale. Judith concluding by discussing how Victorian Mourning inspired the gothic aesthetic with its relationship with death but yet it suppressed women by limiting them to the home and their actions. Where Gothic costume takes inspiration from Victorian mourning, but it seems to empower women. I was excited to hear Nyx was featured on the day since I'm definitely have come to love this brand for its high-end quality for those on a lemonade budget. I first heard via the recommendations of Youtube Black Friday and find her advice is up to par. If you follow me on Instagram. I swear by their eye makeup, especially, Nyx's professional makeup palette ultimate shadow pallette - Brights, NYX Professional Makeup Epic Ink Liner, (which makes doing a cat so much easier) Matte liquid liner, and the Setting Spray Matte Finish. All the demonstration were given by the talented and hilarious Jess with her love of the darkly inclined. She seemed like the perfect ambassador for the brand to showcase load of the goths and darkly incline people. My favourite the 80's inspired Siouxsie Sioux with its, which Jess compared to as power dressing for the face. Garland. I must say is such a sweet person, surprisingly she remembered me from our first encounter the Goth City Festival: Black Planet - Leeds Goth in Perspective. We had a quick chat before her reading I went to quickly grab a coffee, that meant I was slightly late for her reading D'oh She first reminiscing about her experience of gothic sensansiabilites by reading Edgar Allen Poe at the age nine. Also, lead into her feeling like an outcast with growing up rural Devon Which fed into her hysterical but satirical experiences of growing up in Devon her desperate desire to escape it a provincial village. Rosie discussed remembering fondly eccentricity granny who constantly inspired her with her reading fantastical fairy stories. Personally, it stokes a personal code for me, as it reminds of my own experience of my gran how to tell me stories. Garland did a few readings from her books. The Vixen, The Night Brother and The Palace of Curiosities, each of reading she demonstrated her amazing oratory brought the found that demeanour. I purchased one her book the Night Brother, I actually wanted the Palace of Curiosities she sold out sadly. I still got the Night Bother signed. I regret not staying for the Sophie Lancaster discussion which has such a wonderful and meaningful purpose but by this time I really wanted to explore entire venue I think I had missed everything that had occurred by then. So I did a bit of shopping. I think in hindsight I should have really stayed for Sophie Lancashire talk. I should have cut the Nyx tutorial short. This was Soho's a vintage Goth/ alt vintage store that sells an array of preloved clothing and shoes. I remember Soho's from my days as a teenager, I spent with my friend who lived in Huddersfield. When I visited we would often go to Leeds. I bought a handmade skirt for £15, its made of taffeta and velvet embossed pattern that reminds of medieval church tiles. The city museun is having an exhibition Sound Bites, which on till April, it explores the history of Goth and Gothic cultural of Leeds with displays which based on Leeds Goth bands including Sisters of Mercy, Salvation and Red Lorry Yellow Lorry. They is different range of memborilla explores the cities rich dark cultural of the local goth scene. Part the exhibition, explores X clothes one Leed first alternative clothing store specilising in Diy clothing. Wow, that was a helluva festival! The info about Victorian mourning practices is fascinating! Thanks for educating me! It was a great festival and I had alot of fun.Ive been wanting more things like this. I loved the funeral mourning discussion as I learnt so much. What a great time out! Thank you for all the education! 38?? I can't even imagine only thinking I would live to that time! You look amazing in your gown!! Loved what you purchased! Thanks I really wish I could stolen the gown but it didn't fit my arms sadly. I loved all my goodies and happy I found another stag antlers. Rosie Garland sounds lovely! I too was inspired by weird fairytales! I had lots of books with so,e more obscure stories, too! I will look her up! The event sounds great! The event was amazing and defintly worth visiting. I loved every momment of it. I definitely recommend checking Rose Garland out.